[Posted December 15, 2014] On behalf of the active chapter membership, I would like to thank our alums who have been generous in donating their money, time and moral support to Michigan Alpha. Your backing is critically important and tremendously appreciated. A special thank you to all of you who attended the 150th anniversary dinner and 2014 Homecoming Open House. I know that many actives were inspired by your stories and your enthusiasm towards Michigan Alpha. A strong alumni relationship and support system is very beneficial to a chapter’s long-term success. Based on what I've seen in my time here at Michigan Alpha, I think our alums are best in the U of M Greek System. That being said, I believe that we need to constantly work on enhancing our relations so that actives can have more opportunities to bond with alums and establish closer personal connections. I am pleased to say that the fraternity is continuing to grow and improve. Michigan Alpha is fulfilling its mission to be a leader in the U of M Greek System, and in doing so making a positive impact on the campus and the Ann Arbor community. The following outlines highlights 2014, with much emphasis on this the fall semester. PDT had a great showing in this year’s Mud Bowl Tournament. Beating Chi Psi in the first round 35-16, then losing a hard fought battle to SAM 20-12. Our football team has made much progress, and our goal is to make it back to the mud in the coming years. As for Intramurals in 2014, Phi Delta Theta won championships in volleyball, wallyball, inner tube water polo, dodge ball with Zeta, and soccer with AXO, in addition to many runner-ups, including a buzzer beater loss in 5 on 5 basketball. U of M's Recreation Department did not officially award the Stevenson Cup, but we believe PDT finished in first place. In addition, Zach Sprintz '15 won the Fraternity League MVP which in recent years has been awarded to a member of the team who wins the Stevenson Cup. During the 2014 Winter semester, the chapter maintained a GPA of 3.381, which placed us 5th in GPA overall among all 30 fraternities. We were above the all-fraternity campus average of 3.28 as well as the campus average of 3.31. We recruited an excellent pledge class of 16 men who exemplify all of the qualities that a Phi should. The active chapter is very happy with their progression as future members who will activate in January of 2015. The Phikeia are from eight different states including, Georgia, Wisconsin, California, Pennsylvania, New York, New Jersey, Illinois, and of course, Michigan. We are very excited about the upcoming Winter Rush, and plan to have a bigger winter class than we have had in a long time. After the 2014 graduation, our active membership is 80 with our 18 Phikeia. Our total of 98 members places Michigan Alpha above the U of M fraternity average of 82 members. It has never been our goal to be the largest fraternity on campus as we believe that one of the hallmarks of Michigan Alpha’s historic success is the opportunity for men to participate in multiple activities and leadership positions. 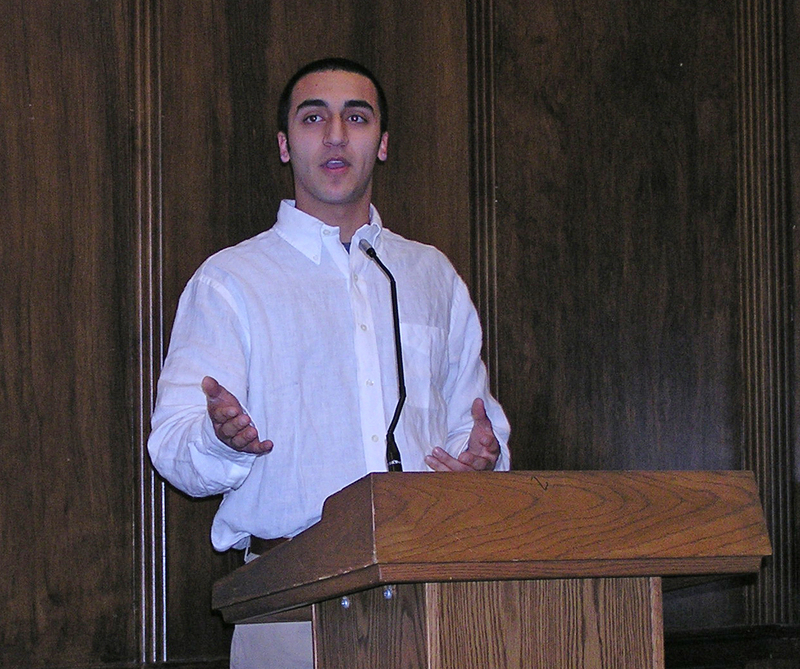 In addition to keeping busy with activities in the chapter, Michigan Alpha members are involved in campus activities such as the Hockey Club, Dance Marathon, Rugby Club, Managing the Michigan Football team, Club Sailing, ROTC, Investment Club, Economics Club, Ski Club and many other organizations. During the football season we were pregame partners with the wonderful ladies from Pi Beta Phi. These tailgates were held at our seniors' house. We were able to have seven successful tailgates even though our football team was only able to have 3 successful home games. On November 20, we had our Date Party at a night club in Detroit it was a great venue which provided many great stories and much fun. Overall, it has been a year of great fun all of the actives in Michigan Alpha, and we plan on the same going into the next calendar year. Michigan Alpha’s commitment to philanthropy remains steadfast as we have continued to work with Ann Arbor Active Against ALS (A2A3) to awareness about, and funds for, combating Lou Gehrig's Disease. This fall we participated in A2A3's Field Day, and last winter we joined with them to host our 6th annual Boxcar Derby which was a great success with a lot of participation from the rest of the Greek community. For the 7th Annual Boxcar Derby which will be held on March 28, 2015, we are planning to expand the reach of this event and will keep the alumni updated on its progress as well as how they can participate or make donations to A2A3. We also have 14 members involved in Dance Marathon, which raises money for Mott’s Children Hospitals. The PDT team has worked closely with a family who has a son with cerebral palsy which provides us with a solid understanding of how our fundraising is making a positive impact in the community. One of our members is ranked 11th out of 910 participants in fundraising for this very worthwhile cause. During the Winter semester, the active brothers are planning to have a wide range of social, philanthropic and athletic events at which alumni participation or support is always welcome. We especially hope that alums will become more involved in the 7th Annual Boxcar Derby which is open to the entire community. [Posted May 3, 2014] Congratulations to Michigan Alpha's 14 graduating seniors pictured in the Big House: Brian Burchman, Keegan Flutie, Jordan Haddad, Chris Jeakle, Matt Kraus, Justin Ulrich-Lewis, Josh Lowenthal, Alex Ludlow, AJ Malhotra, Matt Moy, James Roderique, David Seidman, Nelson Smith and Dan Vredenburg. Great to see them continue the new tradition of proudly wearing PDT sashes at commencement that was started during the years after the chapter was refounded. [Posted February 22, 2014] Congratulations to the Michigan Alpha active chapter leadership and Sigma North Province President Nat Love '81 for organizing and hosting a very successful PDT Bi-Province Conference at the Michigan Union on Saturday. The conference was attended by more than 125 active member Phis from nine chapters in the Sigma North and Sigma South Province that covers Michigan and parts of Ohio. In addition, alumni leaders from Michigan Alpha and other chapters attended. Remarks and presentations were made by PDT General Council Reporter Jeff Davis (Southeast Missouri State '94), former General Council President Michael Scarlatelli (Kettering '76), U of M Office of Greek Life Director Mary Beth Siler and a U of M student support group on issues of high importance to properly operating fraternities, risk management and achieving excellence. Love and Sigma South President Jim Warner (Akron '71) have been organizing this annual event for over 14 years. Both Love and Warner felt that the conference succeeded in sharing information on best practices while broadening connections between leaders from different PDT chapters. 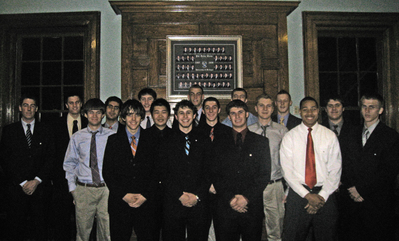 [Posted February 13, 2014] The active chapter's momentum is continuing with another strong pledge class. The 2014 Winter Pledge Class has 10 freshmen. Half of the pledges are from towns in Michigan, but the class includes geographic diversity reaching coast-to-coast -- and even Europe. Building on the 21 new initiatives from the 2013 Fall Pledge Class, Michigan Alpha is on track to add 30 new members in one school year for the second time during the last three school years. The current active membership stands at 90 men -- 100 total members including the Phikeias. This is the chapter's largest membership total since the 1990s. Congratulations to the Rush Chairmen and all brothers who made a strong effort to grow the fraternity with men who are willing to uphold Phi Delta Theta's high standards for academics, character and brotherhood. [Posted February 2, 2014] Michigan Alpha is expanding its impressive commitment to philanthropy by forming an eight member team to participate in the 2014 Dance Marathon at U of M (DMUM). This is the first time PDT has participated in this extremely popular U of M student-run charity event that features 30 hours of non-stop dancing by participating teams. DMUM, which is a 501(c)(3) non-profit organization based in Ann Arbor, facilitates partnerships between students and families with disabled children who have special therapy care needs not currently covered through health insurance or government assistance. This year's dance marathon will be held on February 15 at the U of M Track and Field Building. It is one of the University's most respected and high energy philanthropy efforts as it brings to hundreds of U of M student to raise financial donations in conjunction with the event. All donations raised by student teams are used to pay for children with severe disabilities to receive non-traditional physical and social therapy from the C.S. Mott Children's Hospital at U of M or Beaumont Children's Hospital in Royal Oak. During the 2013 DMUM, student teams raised the record amount of $516,707. Since its establishment in 1997, DMUM has raised more than $4.6 million that has benefited hundreds of children as well as the therapy programs at the hospitals. Michigan Alpha's 2014 dance team is partnered with the Duggins family in Ann Arbor who has a little girl with Down Syndrome and Autism. The chapter's goal is to raise $2,500 that will pay for this girl to receive special therapy from C.S. Mott Children's Hospital at U of M.
The actives are very enthusiastic to help the Duggins Family's young girl while making a proud showing for PDT in this high profile campus charity activity, but they would benefit from assistance from alums to achieve their fundraising goal. It is worth noting that donations to DMUM are tax deductible. Also, corporate sponsorship packages -- more than 50 local businesses and several national corporations are currently sponsors -- are available through DMUM. The Alumni Association encourages alums to make contributions through DMUM's secure online donation processing web site that credits Michigan Alpha's fundraising for the event (https://dmum.donordrive.com/index.cfm?fuseaction=donate.start&destination=P&eventID=554&participantID=7271). Every dollar raised helps! The deadline to donate is February 15, so please consider donating today to help the active chapter make a big difference for a local family in need while further demonstrating Michigan Alpha's strong dedication to philanthropy. If you have any questions or want information about corporate sponsorship opportunities, please contact Michigan Alpha's 2014 DMUM team leader Connor Gibney '16 at cgibney@umich.edu. [Posted August 30, 2013] Yesterday in Ann Arbor, active chapter president Patrick O'Connor '15, and Vice President Drew Nikolai '15, met with U of M sports legend Don Lund '45 to inform him about the newly established Harmon-Chappuis-Lund Award. The award will annually recognize the active chapter member who is most valuable to the success of Michigan Alpha's intramural sports teams competing in the U of M Fraternity League. Lund went on to become the U of M Athletic Department Associate Athletic Director under legendary AD Don Canham. He was elected to the Michigan Hall of Honor in 1984 and Michigan Sports Hall of Fame in 1987. In 2013, the Michigan Alpha Alumni Association board of directors established the Harmon-Chappuis-Lund Award to honor three Michigan Alpha Men -- Tom Harmon '41, Bob Chappuis '48 and Don Lund '45 -- who brought great honor to the fraternity for their outstanding achievements in U of M athletics and careers after college. In addition, Harmon and Chappuis actively supported Phi Delta Theta throughout their lives, and Lund continues to do so to this day. The Alumni Association tasked the active chapter with the responsibility of nominating eligible men and choosing the winner of the award each year. The first recipient of the award was announced during the active chapter-alumni social event -- the Harmon BBQ -- during the day of the 2013 Michigan vs Notre Dame football game at which Harmon will be named a "Michigan Football Legend" by the U of M Athletic Department. Zach Sprintz '15 was presented with this honor in recognition of his leadership as PDT's Intramural Sports Chair during the 2012-2013 school year. Under Sprintz's direction, PDT won the 2012-2013 All-Sports IM Championship for the Fraternity League. This was Michigan Alpha's first championship since the 1984-1985 school year although PDT only narrowly missed this outstanding achievement a couple of times in recent years. [Posted May 10, 2013] The U of M Intramural Fraternity League features 25 teams that fiercely compete in more than 15 sports each season. Winning the top honors in this league requires a broad range of athletic talent and team disciple throughout the entire school year. We are especially interested about filling in the blanks on the fraternity's history to prepare for Michigan Alpha's 150th anniversary in 2014. The Alumni Association can be contacted e-mail at pdtumich@gmail.com. [Posted July 1, 2011] On behalf of the active chapter membership, I would like to thank our alums who have been generous in donating their money, time and moral support to Michigan Alpha. Your backing is critically important and tremendously appreciated. I especially wish to thank the leaders of the Alumni Association/House Corporation and the Chapter Advisory Board for donating countless hours of your time to help the active chapter stay focusedon the right direction while also keeping our historic 108-year-old chapter house in outstanding condition. It is clear that fraternities with strong alumni participation and support enjoy a significant advantage over other houses. Based on what I’ve seen and heard as president, I think Michigan Alpha’s alums are best in the U of M Greek System. There is no question in my mind that a big part of Phi Delta Theta’s success on U of M’s campus has been made possible because of our alums. The active chapter is mindful that your support must be earned every year – we take nothing for granted. I am pleased to say that the fraternity is continuing to grow and improve. Michigan Alpha is fulfilling its mission to be a leader in the U of M Greek System while making a positive impact on the campusand the Ann Arbor community. It is my hope that you will find our achievements worthy of your continued support and make you proud to say you are a Michigan Alpha alum. The following outlines highlights of the first half of 2011.